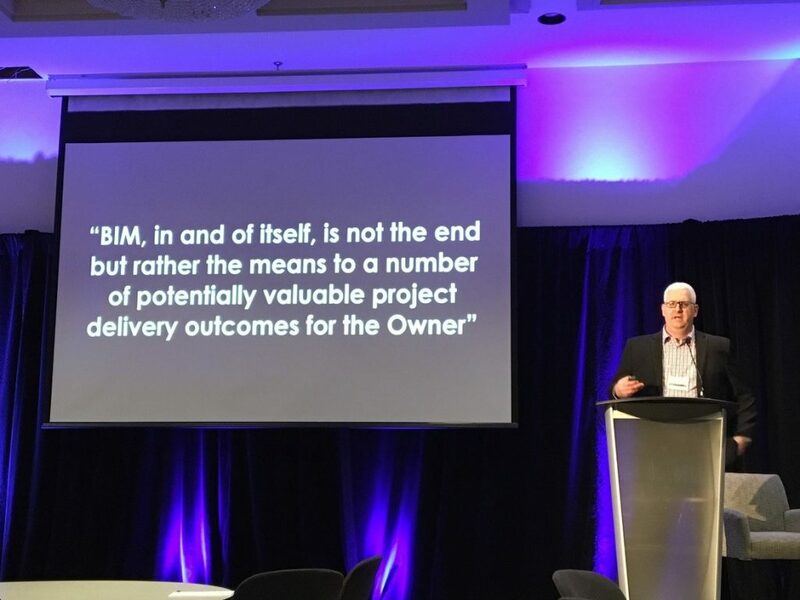 Brian Skripac and I recently attended the Canada BIM Council Regional Conference in Montreal on April 12. It was a fantastic event that united BIM leaders from various industries across Quebec. The Canada BIM Council (or CanBIM) is Canada’s collective voice for the construction industry, education community and owners who are working with Building Information Modeling technologies and practices. 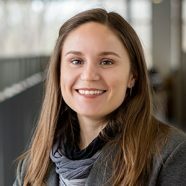 The group’s mission is to provide professional support, advocacy, learning opportunities and best practices for BIM in a Canadian context while maintaining a close relationship with international BIM groups. The organization hosts numerous sessions throughout the year to bring together members and guest speakers to openly discuss the latest trends, standards and methodologies relating to BIM. 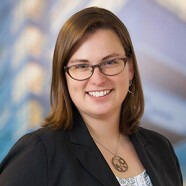 The recent Montreal conference was a daylong event full of 30-minute presentations all connected to the theme, “For the Fun of BIM: Fostering a Culture of Innovation.” The conference sought to foster dialogue that offered a compelling case for fully integrating BIM into our day-to-day practice by focusing on the technology’s playful and fun aspects, highlighting especially the positive impact it can have on work environments. CanBIM’s YouTube channel will be updated with various videos of the day’s presentations. The conference kicked off with a keynote address by Daniel Hurtubise, BIM Manager at Renzo Piano Building Workshop. Daniel’s presentation focused on educating our collaborators, project managers, consultants and clients of the benefits of BIM relative to traditional project delivery methods. He gave examples of two similar projects, one completed in AutoCAD and the other done in Revit, and showed, through project stats, that the BIM project was able to output 2x the amount of information with 20% less staff and a significant reduction in the number of files produced. He then briefly touched on the future of collaborative design using AR/VR, computational and generative design, and how we, as designers, must become more methodical in our ways of working/thinking in order to best leverage these technologies. 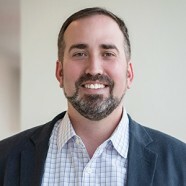 Our own Brian Skripac was the second speaker of the day, and discussed CannonDesign’s work with The Ohio State University. His presentation was well received (by a predominantly French-speaking audience, no less) and fostered an interest in CannonDesign’s experience working with building and property owners to develop BIM project delivery standards. If you are not familiar with the work CannonDesign has done with Ohio State, you can learn more here. Next up was David de Koning, Senior Structural Engineer with Arup. His presentation, Design to Craft – Opening the Door to Total Architecture, discussed bringing BIM tools into the project at the onset, allowing for ease of coordination and the ability to shape projects, in detail, and fully express creative vision. He backed this up with the impressive work Arup is doing for the structural design of the 6 main central spires of the Sagrada Familia, where the complex structure is able to be coordinated with the architectural elements to the millimeter. 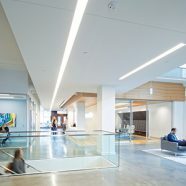 BIM enabled the team to move the model direct to shop drawings, then directly to the manufacturing plant for CNC milling of the custom structural fittings. The next presentation came from the law firm Miller Thompson and touched on how blockchain can generate smart BIM contracts. 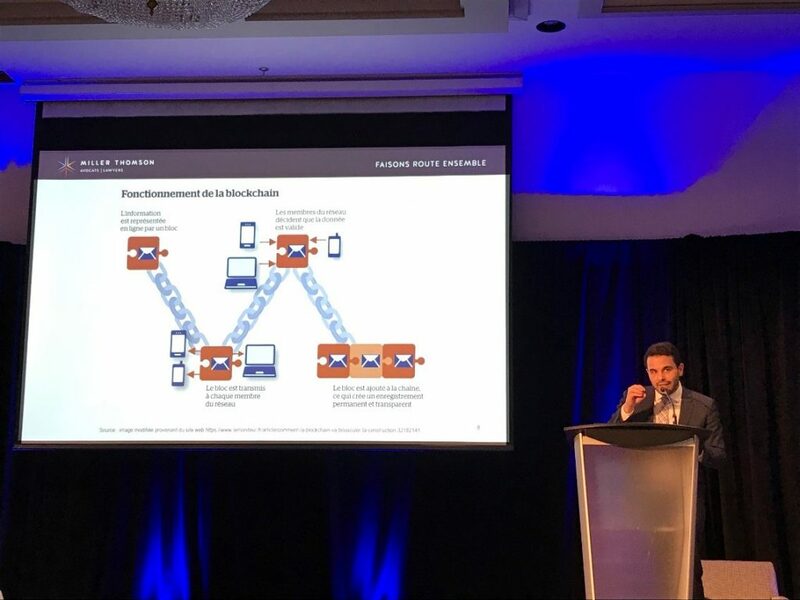 While the concept of applying a blockchain model to a BIM delivery contract is interesting, it was definitely met with some skepticism from the audience. Despite that, the legal concept of using blockchain as the foundation of BIM data seemed to be an interesting method to trace data (i.e. each piece of information is placed within a “block” and contains the identity of the user who created the data. Once the content is validated, it is placed within a “chain of information” and becomes traceable – new information is added to the chain in an iterative process, rather than replaced). The presentation also addressed contracts that exist partially or wholly within a computer program, allowing certain clauses to be executed automatically, in real time. Such contracts eliminate intermediaries while strengthening transparency. 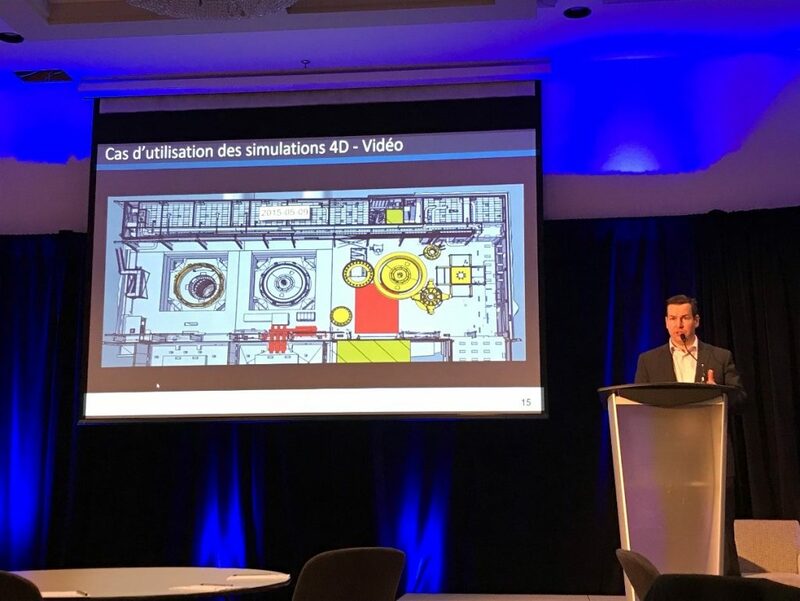 Michel Guevremont, engineer and Scheduling/Estimating Advisor at Hydro Québec, discussed Hydro Québec’s initiative to add 4D simulation for virtual construction of new facilities and rehabilitation projects. In addition to sequencing the work, the simulations include construction equipment, just-in-time deliveries, equipment displacements, storage and distinctive trade works. They have used 4D simulation on numerous contracts, including mechanical, electrical, architecture, turbine-generating units, concreting and superstructure to effectively manage scheduling and implantation of the various works on site. 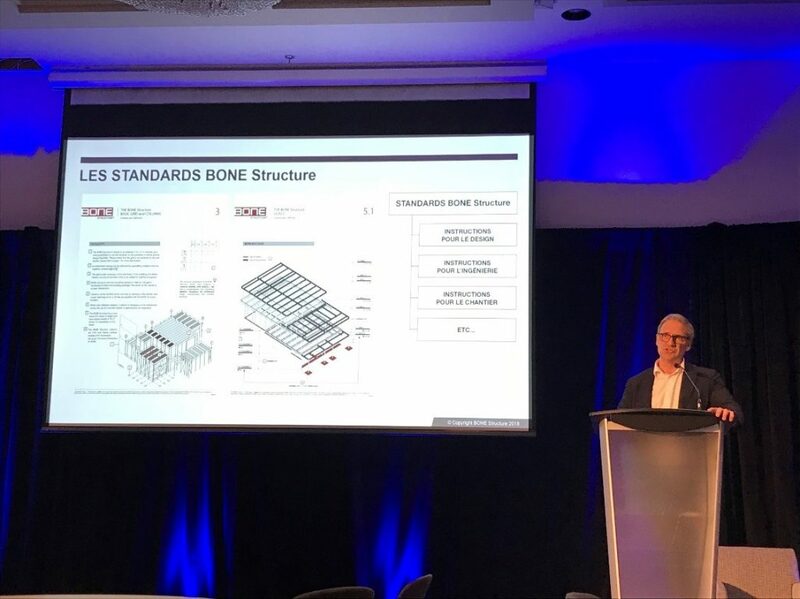 Marc Bovet, President and Founder of BONE Strucrure, then gave a lively presentation titled BIM – Use it to Build, or Die! While the presentation was a bit disjointed and hard to follow at times (note: Brian and I each had an earpiece where we could hear a real-time translation to English for presentation that were given in French), it did not discount the innovative work that BONE Structure is undertaking in the custom home industry. Their process effectively brings projects from Sketchup to Revit, then directly into Inventor where they create a standard kit of parts to produce the shop drawings that go directly to the manufacturer. Within weeks, the various components are on site and ready for erection and, on average, the structure and envelope of a 3,000sf home can be erected in less than 10 days. In addition, the homes produced are Net Zero ready and can easily reach LEED and PassiveHaus certifications. An added benefit these structures have zero waste and recycling initiatives which aim to eliminate waste on the construction site. Marie-Andrée Forest and Julie Trottier, architects with local Montreal practice Aedifica, then spoke about the benefits of technology to promote innovation in construction. 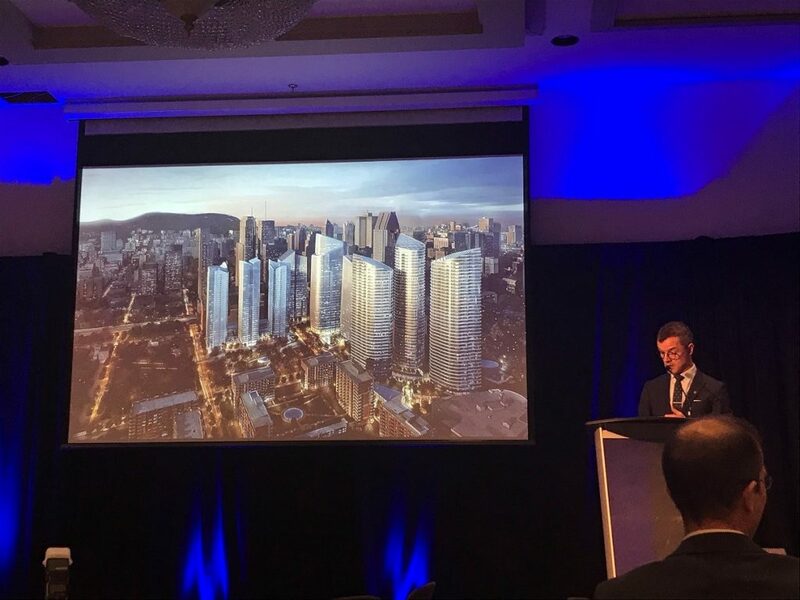 Their presentation, BIM for Collaborative Creativity: Going beyond Traditional Methods, highlighted Aedifica’s use of BIM throughout all phases of a project, using the revitalization of Complex Desjardin as a case study. Client involvement in the BIM process from the onset was crucial to the success of the project, and the team’s ability to effectively communicate via an interactive experience sold the client on design moves that would otherwise be difficult to understand using traditional methods. The use of emerging technologies like VR, video gaming, and 4D phase planning facilitated collaborative decision making. In addition, 3D interdisciplinary coordination, use of point cloud surveys, as well as on site mobile technologies allowed the team to deliver a quality project while overcoming technical challenges and responding to the architectural complexity of the work. Lieu Dao and Basile Nicolas, from local contractor, Pomerleau, then spoke about VR and AR during construction and for facilities management. 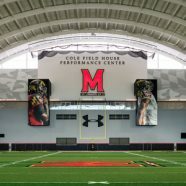 Their in-house POM-AR4D platform offers immersive experiences to their partners, clients and end-users, but also effectively communicates construction sequencing and other meaningful project information to work crews and facility operators. This has been deployed on numerous projects (currently 75% of their active projects use BIM), including hospitals, laboratories, and airports, civil and commercial work. Their VR/AR users reported that it was easier to explore the 3D environment in VR than by simply looking at a 3D mock-up, and that in this environment, using a headset, they better understood the spatial qualities of the project as well as the scope of the work. 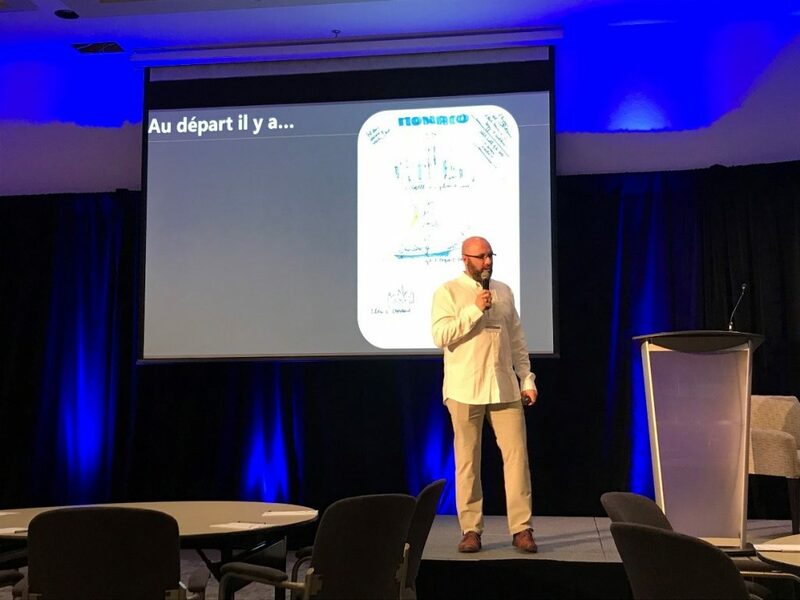 The day wrapped up with an interesting presentation by Damien Siles, the general director of the Quartier de l’innovation de Montreal (roughly translated: the Montreal Innovation neighborhood). The Quartier de l’innovation is a world-class urban laboratory that has taken shape in Montreal’s emerging Griffintown neighborhood (an approximate 5 square kilometer area) that is currently experiencing a $6 billion real estate boom. The program was initially launched in 2013 under an academic initiative between the École de technologie supérieure (ETS), McGill University, Concordia University and Université du Québec a Montréal, and is now financially supported by the City of Montreal, the Government of Quebec and the Government of Canada, as well as 25 corporate partners. Their mission is to foster an urban innovation ecosystem where experimentation and collaboration between academics, entrepreneurs and residents generate benefits for both the local and global societies. They have created an Open-Air Laboratory for Smart Living (in collaboration with Ericsson and Videotron) where they offer researchers, companies, residents the environment and the infrastructure to test technologies aiming to improve the daily life of Quebecers. This is an interesting initiative that I encourage you to learn more about. In full, the CanBIM event proved to be an engaging, informative and inspiring conference. Brian and I are already looking forward to future events.